The next time you go grocery shopping, look at your cart. Is there anything there that you like, but is unnecessary for you to buy THAT brand in particular? Let me tell you a secret. 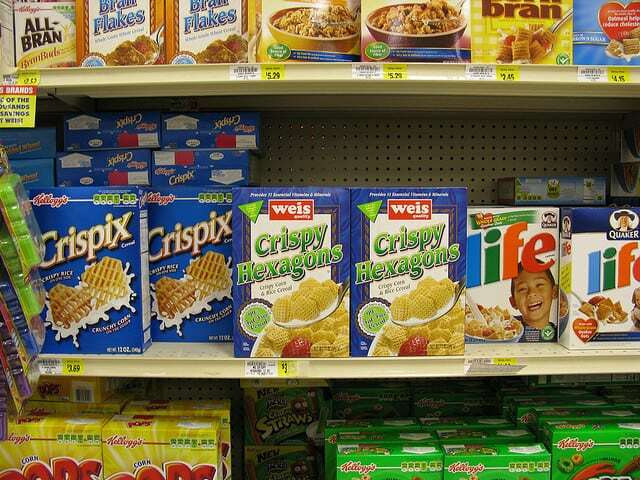 Generic foods/store-brand foods are often just as good as some of the better name brands sold on the same shelf. They’re less expensive because the grocery store wants to make sure that you can still get what you want even though you’re not paying as much as you might for the name brand. This way, they can ensure that you’re not pricing yourself out of owning the product entirely, and they can still squeeze a couple extra dollars out of you. Let me dig a little bit deeper, though. Private label products or services are typically those manufactured or provided by one company for offer under another company’s brand. Private label goods and services are available in a wide range of industries from food to cosmetics to web hosting. They are often positioned as lower cost alternatives to regional, national or international brands, although recently some private label brands have been positioned as “premium” brands to compete with existing “name” brands. There are two things to note, here. Firstly, I don’t expect to see this information on wikipedia, but the fact is that the same private label companies that manufacture products for the store brands also manufacture products for the international brands, as well. You won’t find that information in a press release (or even listed in a recall notice) because that’d cost someone money. If you take two containers of the same product from two different brands and compare the packaging, the “from” location, the nutritional information (as in the calories, the fat grams, the sodium and carb counts) and the ingredients… and all of it is the same? They were manufactured at the same location and are of identical quality. The only difference would be… the price. A big reality is that the fastest (and, in a way, creepiest) way to find out exactly who is responsible for making what products… is to pay attention to food recalls. Yes… food recalls. Want an example? Zemco Industries, a Buffalo, N.Y., establishment, is recalling approximately 380,000 pounds of deli meat products that may be contaminated with Listeria monocytogenes. As a beginning clean eater, it’s a bit of a struggle and takes quite a bit of time to find the right blend of brands for your home. But once you see the change in your wallet… it all starts to feel worth it. Give it a shot and see what works best for you! This is really good info. I have no problem buying generic or private label but I didn’t know that it was the same big manufacturers producing the products. Very informative. I’ve often heard inklings as to the store brands being manufactured by the “designer” brands but had never investigated the veracity of it. Your research as always is thorough and compelling. I know I for one, will be buying a bit more of the store brand amenities. Though however, I will admit there are certain products to which I won’t leave to chance! Thank your for this post! I agree with you, we could save money by buying generic. That is what I do although I am not considered posch by some of my friends. I found about you on YAHOO! and I am going to talk about you on my Blog in Australia for women. I never thought about off brands like that! That’s interesting. I also would like to go through your old posts via your archives, but it doesn’t seem to be working for me?? I’ve been trying store brands for a few years now. I would say with about an 80% success. I have picky eaters at home. I heard about a new site at Church. http://www.mygroceryspy.com It compares prices at the top stores here in Atlanta. From what I’ve read, it updates twice a week and shows where the lowest prices are on a few hundred items. You can print out your shopping list or have it sent to your phone. (I’m not savvy enough for that though). I email them since their not up yet, and they told me they will be up on January 20 in Atlanta and Birmingham AL. then other cities. I can’t wait to try it. I used to buy the generic brand until a friend of mine taught me the art of using coupons. for example now I buy the name brand cereal for no more than a dollar a box when I combine a coupon with a sale. When the thing I want to buy goes on sale that’s when I stock up for at least 3 months worth because I know that the store will put that item on sale in about three months again. I do like this site and the information that you put out is really good. I have even changed the calendar that I used to make my family meal plans on to the calendar that you created for the clean eating calendar. Thanks so much for the info.